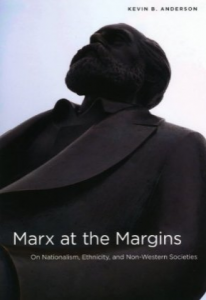 This year’s winner of The Paul Sweezy Marxist Sociology Book Award is Kevin Anderson for his work Marx at the Margins: On Nationalism, Ethnicity, and Non-Western Societies (University of Chicago Press, 2010). The award committee, chaired by Tom Keil, and consisting of Keil, Rod Bush, Tom Conroy and Wendi Kane, described the work as: “[A] thoroughly researched and well-crafted presentation and analysis of some of Marx’ lesser known writings dealing with imperialism and its consequences. It takes the reader down heretofore largely unappreciated work by Marx and Engels on the role of nationalism, race, ethnicity, and class in a broader dialectic of social change than is commonly thought of when dealing with the content of Marx’ theory. Marx’ is also shown to have understood how the structure of a social formation, in Russia for example, shaped its imperial policies, especially as directed at Poland and Poland’s resistance in the uprising of 1863.